Ask my achy knees and they'll tell you my running days are behind me. But you wouldn't have known that if you'd seen me "running" around Central Park on an ElliptiGO during a recent trip to New York. Ask my achy knees and they'll tell you my running days are behind me. But you wouldn't have known that if you'd seen me "running" around Central Park on an ElliptiGO during a recent trip to New York. A what, you ask? 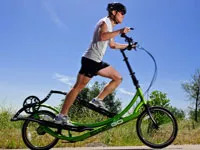 Imagine the love child of an elliptical trainer and a bicycle—that's an ElliptiGO. It handles, shifts, and brakes like a bike, though it's a bit heavier and longer. But there's no seat, so you stand while you pedal. I met up with former Olympic pentathlete and current ElliptiGO enthusiast Michael Gostigan (he came in 9th in the individual event in Barcelona in '92) early on a Sunday morning to give the bike a go. I felt a little wobbly at first, but within a couple minutes the movement began to feel pretty natural. That's not to say the experience was easy—not only did it challenge my leg muscles and get my heart pumping big time, but also my core muscles had to work like mad to keep me upright and balanced. In short, I had a killer workout. The ElliptiGO is meant to simulate running without the impact, and indeed my knees felt great throughout. The movement felt more like being on a long-stride elliptical trainer than running, but it was close. It struck me that this would be a terrific cross-training device, even for folks with perfectly sound knees. One caveat: It's meant to be portable (the steering column folds down easily), but the ElliptiGO fits only on certain types of bike racks (not including mine) or in the back of a larger SUV or station wagon. So if my Honda Civic-driving self were to purchase one (not likely, given the steep price tag), I'd be limited in terms of where I could ride it. Pros: You get the thrill of running without the impact on your joints, plus it's very easy to master. Cons: It's pricey and can be hard to transport. Extra tip: The company offers both demos and free test rides in some cities, so you can try before you buy.